A choice of 3 unique modern White London Taxis ideal for weddings, any celebratory occasion and TV & film work. 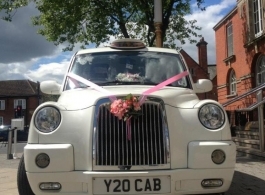 These lovely matching taxis are especially suitable for weddings as they have a vast amount of leg room, perfect for brides with the fullest of wedding dresses and also great for bridesmaids and/or family members/guests. Each taxi comes with a smartly dressed, experienced driver and are air conditioned for your comfort. White flowers and ribbons are provided as standard but can be changed to suit your colour scheme. Based in Sale near Manchester these cabs will consider travelling anywhere in the UK and all are wheelchair accessible as they have built in ramps.